This dinner is a big hit at my house; in fact it was hubby's #1 dinner for many years (it has since been replaced in ranking by meatloaf). It is also my go-to dish when a friend has a baby. I can make it ahead and either cook it and bring it over hot or get it all ready and they can simply stick it in the oven. It also tastes really good reheated. Prep Time: 50 minutes (Baking the chicken and mixing ingredients. Mix together cooked/cubed chicken, soup, and water. Put the chicken mixture into the baking dish. Lay Swiss Cheese slices on top of chicken. Melt butter. Add stuffing. Mix well. Pour stuffing on top of Swiss Cheese. I just started putting in green beans, probably about 1 1/2 -2 cups of green beans. Cut green beans into 1/2-1 inch pieces and mix into casserole. 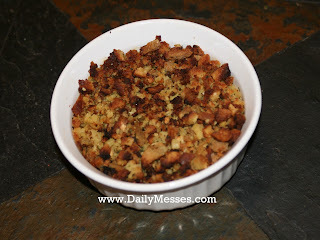 Top with stuffing as above and cover with foil. Bake for 30-40 minutes. Uncover and bake another 10 minutes.